If accessing your hunting area is a challenge due to swamps, mud, fallen logs or steep and rocky terrain, then Can-Am might just have the answer to your prayers. Let’s do the offroad math: Four wheels are certainly better than two, so it only stands to reason that six must be better than four. The 2019 Can-Am Outlander MAX 6x6 4DPS 450 ATV features true six-wheel traction. Very simply, it’s built to haul gear and get the job done. This six-wheeled vehicle was purpose-built to be every bit as capable as its larger displacement siblings, but it’s much more affordable, retailing for less than $10,000. 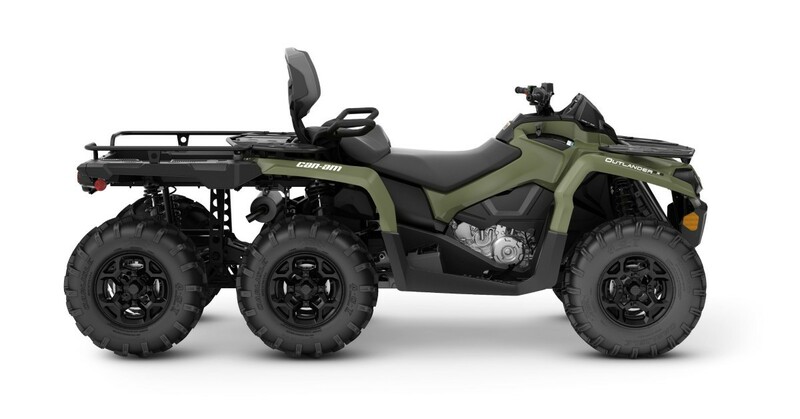 One comment about vehicle options: The Can-Am Outlander 6x6 450 comes in any color you desire, so long as that color is green. Seriously though ... what other color would a deer hunter possibly want in a 6x6? Green — let’s call it “bowhunter green” — suits this workhorse perfectly. The CVT (Continuously Variable Transmission) means no shifting is required. The system includes standard engine braking, P / R / N / H / and Extra Low. The CVT housing has 13 bolts to ensure a proper seal and also includes an integrated drain plug. The extra-low L gear provides comfort for low-speed riding and an exceptional and smooth traction when pulling heavy loads. The engine's air intake and CVT inlets have been positioned as high as possible on the Can-Am Outlander MAX 6x6 DPS 450 to improve breathing while navigating wet and muddy conditions. The Tri-Mode Dynamic Power Steering (DPS) system features three modes (MIN, MED and MAX) allowing riders to select the desired amount of steering assist to adjust to the terrain requirements and to his riding style. For situations that require optimal traction and as much contact with the terrain at hand, the Outlander MAX 6x6 offers both 4x6 and 6x6. In 4x6 mode, all four, rear wheels provide traction. Once 6x6 is selected, the system intelligently transfers power from the slipping front wheel to the opposing wheel with traction and is not hampered by speed or rev limiters. The system progressively and automatically locks and requires no additional buttons to push or levers to hold. The Outlander 6x6 vehicles use an industry-exclusive, four-wheel independent rear suspension that eliminates scrub and camber changes. The wheels pivot up and down rather than in a butterfly motion. This ensures the vehicle moves only in the direction you point it and is designed to improve traction and optimize transfer of power to the ground. Offering a five-way preload adjustable shocks and 8.8 inches of suspension travel, it can soak up rough terrain. It has 10.5 inches of ground clearance. The 2019 Outlander 6x6 ATVs feature four outboard 214mm hydraulic disc brakes with twin-piston calipers, front and rear, for superior stopping power. The 450 package includes the proven 26-inch ACT Radial tires for a smoother ride, increased durability and better shock absorption. Fully equipped to move a load or tow food plot implements, the Outlander MAX 6x6 450 has a reinforced 2-inch receiver hitch and a 1,650-pound towing capacity that comes standard. The Outlander 6x6 vehicles have a capacity of 5.4 gallons, which means you can ride longer and work harder without stopping to mess with fuel. The Outlander MAX 6x6 450 ATV has front steel rack capable of connecting LinQ quick-attach accessories. The unique rear cargo platform is designed to be versatile and adaptable for hauling a wide variety of loads and includes added cargo extenders. The Outlander ATVs are made to work: The front rack can carry up to 120 pounds; the rear rack, up to 350 pounds. A convenient, 2.9-gallong water-resistant rear storage compartment is located in front of the rear cargo area. The 2019 Can-Am Outlander MAX 6x6 450 gets the family's longer wheelbase. The added 90-inch length allows the passenger to sit in front of the rear axle for improved handling and comfort. The stretched design also improves the ride and handling for single riders. The seating system allows for gradual bending of the backrest and pivoting to reduce kick-back during acceleration and braking. Can-Am’s easy-to-read multi-function gauge is equipped with a digital information center, including a speedometer, tachometer, odometer, trip meter, gear position, hour meter, engine hour meter, temperature and engine lights, fuel gauge and clock. The Digitally Encoded Security System (D.E.S.S.) anti-theft device includes both a performance key and regular key. Can-Am is the only manufacturer to offer a factory-installed anti-theft device as standard equipment. Equipped with dual 35-W front headlights, with selectable high and low beams, for superb visual clarity while driving to and from hunting areas in the dark.